Question: Hi my name is Vaibhav; i wanted to know that how i can securely empty in the trash without giving any way for recovering the deleted file as i think deleted files are some where hidden so that they can be recovered by using some software mechanisms. Is there any third party tool which i need to use it so that i can satisfy my concern? Answer: Yes Vaibhav you are absolutely correct when you generally empty the trash contents the files in it are not completely trashed / deleted but its mere that this space is made available for other files to occupy in your system. You will not be requiring any third party software tools to address your concern of securely trashing of the files, but just you need to do some minor changes in the settings in your MAC and are done with the secure empty trashing of the files from the trash automatically. First lets see how you can securely trash manually. Generally, by right clicking on the file or by pressing Ctrl + Left Clicking will find an option of trash and then you can empty the trash in similar way. But for Secure deletion of the trash, you need to press Command + Right click or Ctrl + Command + Left click on the trash icon and then all you need to do is to just select “Securely Empty Trash”. If you don’t want to manually empty the trash securely and would like to change your system so that every time you delete, files will be trashed securely. But for this you just need to do some simple and small changes in your system as explained below. Firstly, you need to open “Finder” in your MAC. Now, go to the “MENU” and then click on “Finder Preferences” option from the list. After selecting the finder preferences option, a new pop up will be coming up wherein you will find options like General, Labels, Sidebar and Advanced. Now all you need to do is to just click on the “Advanced” tab. 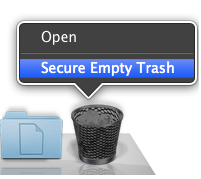 After clicking on the advanced tab option , check the “Empty Trash securely” check box option. 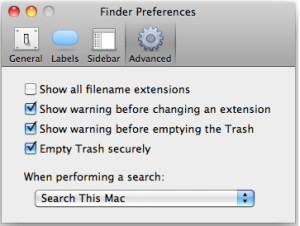 Now simply close the Preferences window after checking the empty trash securely option. So after selecting the option of “Empty trash securely” you will now be able to empty trash automatically without needing you to empty trash manually every time.